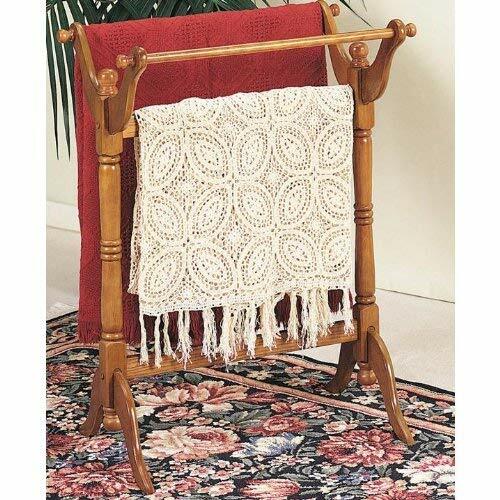 With a rustic and graceful styling, this blanket rack grabs your attention. Decorative scrolled metal exudes beauty and provides useful storage for quilts, comforters, or towels. 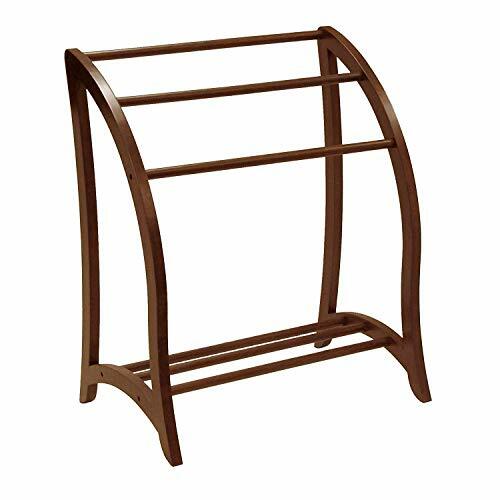 Perfect for bedroom or living room, this beautiful quilt rack will provide a wonderful accent to all your d cor. This wonderful piece offers 3 racks total and its bronze rub through will vary piece to piece for one-of-a-kind look. Dimensions include: Overall: 31.5" W x 16" D x 35.25" H. This one-of-a-kind item approximately weighs 12.5 pounds. Only quality materials and manufacturing will do. Product materials include: tubular steel. Assembly required. Made in China. 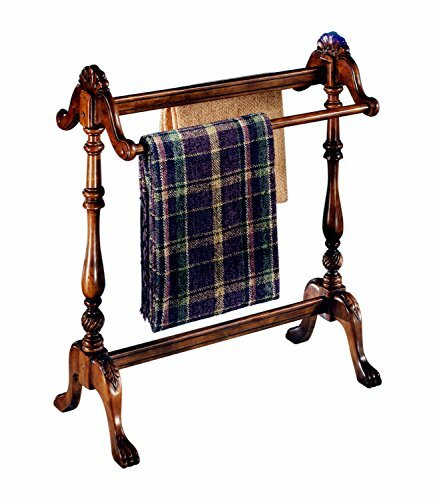 Brand: Southern Enterprises | Manufacturer: Southern Enterprises, Inc.
Keep spare linens within reach.Rack holds 3 quilts or bath towels. Beautiful walnut finish easily coordinates with existing d cor. 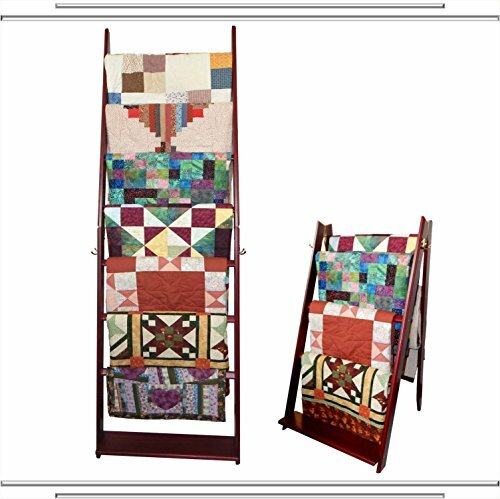 Perfect for the family room, den or bedroom, this stand is great to store and display quilts and blankets. Web exclusive! A charming addition to any room that offers extra storage anywhere you need it. 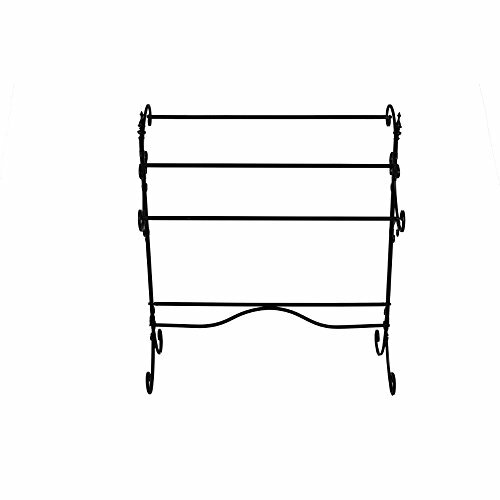 Clear out some clutter from your bedroom with this blanket rack, a perfect addition to your home. 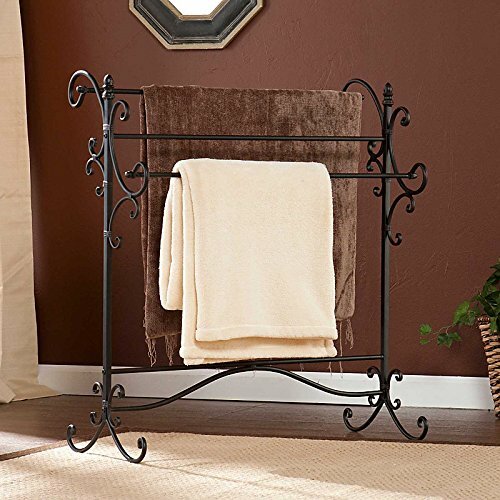 Crafted of metal, it features three bars to hold up clean sheets, towels, and throws. This charming scrolled design has a Black finish with a bronze rub that blends easily into any existing arrangement, while grabbing everyone's attention. Place this versatile piece beside your sofa, bed so your coziest blankets are never out of reach and even use it for placing bathroom towels. 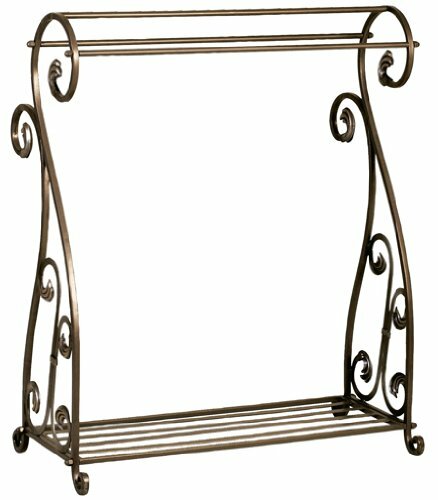 This Blanket rack combines with decorative metal scroll work for an effortless traditional style. Offers three bars that store blankets, quilts, comforters, or towels for a versatile use. This elegant and regal composition will update any living room, Bedroom or bathroom. It measures 16l x 31.5W x 35.2H that can easily be accommodated with any decor Styles. It attracts less dust and provides easy cleaning at regular intervals. 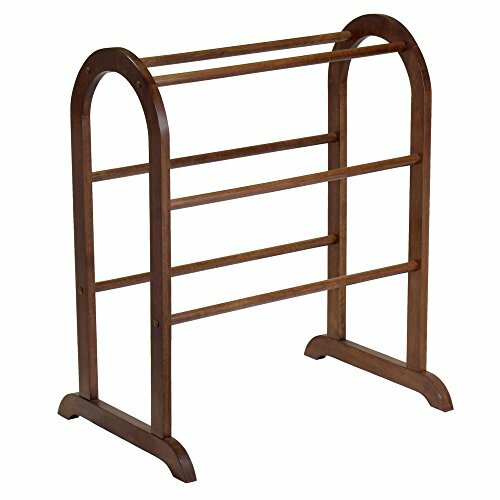 Aged Bronze metal blanket display rack features scrolling and slotted bottom shelf for extra storage space. With three bars for hanging quilts blankets, clothes, etc. Sturdy enough for the heaviest of quilts. Assembly required. Dust with a dry cloth. Display your quilts in style! The LadderRack is a versatile quilt display rack that adjusts to suit your needs and space allowance. You can have it folded in an A-frame next to your couch or lean it against the wall in ladder form so everyone can admire your artistic work. Whichever way you choose to use it, you will not be disappointed with how beautiful your quilts look hanging on it! 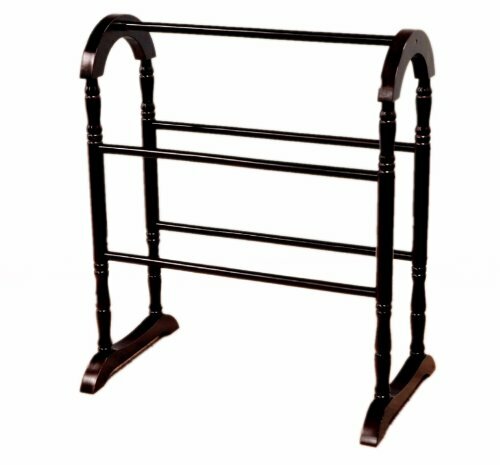 Our 5 Rung 30" Model Features: a height of 5 1/2 ft., 5 reinforced smooth rounded display rungs that won't damage your quilts or blankets and that won't turn and twist over time, a 6" deep shelf at the bottom for storage or display items, & a hand stained - hand rubbed smooth satin poly finish. Non-slip pads to protect floors and walls are also included. Handmade in the USA from premium clear pine. *Assembly Required. 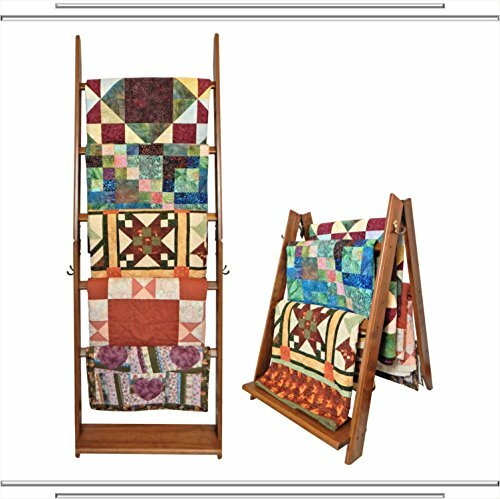 Dimensions: Ladder: H:67 1/2" x W:30" / A-frame: H:33 1/2" x W:30" / with a 28 1/2" Interior quilt display allowance for each rung & the shelf. Get 2 Quilt Displays for the price of 1! Our LadderRack converts from a Quilt Ladder to a Quilt Rack without tools. Display your quilts in style! The LadderRack is a versatile quilt display rack that adjusts to suit your needs and space allowance. You can have it folded in an A-frame next to your couch or lean it against the wall in ladder form so everyone can admire your artistic work. Whichever way you choose to use it, you will not be disappointed with how beautiful your quilts look hanging on it! Our 7 Rung 30" Model Features: a height of 7 1/2 ft., 7 reinforced smooth rounded display rungs that won't damage your quilts or blankets and that won't turn and twist over time, a 6" deep shelf at the bottom for storage or display items, & a hand stained - hand rubbed smooth satin poly finish. Non-slip pads to protect floors and walls are also included. Handmade in the USA from premium clear pine. *Assembly Required. Dimensions: Ladder: H:90" x W:30" / A-frame: H:45 1/2" x W:30" / with a 28 1/2" Interior quilt display allowance for each rung & the shelf. Horizontal rails for hanging quilts, comforters and bedspreads. Product Dimensions: 31W x 15 3/4D x 36 1/4H. Brand: Frenchi Home Furnishing | Manufacturer: Megaware Inc.